For nearly a week, it appeared a Category 2, 3 or 4 was headed our way. Luckily, when Florence came ashore, she was downgraded to a Cat 1, and I might say, a STRONG Cat 1. Carolina Plantations guess was that 50% stayed and the rest sought shelter elsewhere. Were those of us who stayed nuts? Were those who departed overly cautious? What I think a lot of new people to the coast of NC learned is that a storm is as unpredictable as your local weatherperson’s daily forecast. Things change but, tis always better to err on the side of caution, a wise person once said. The number one cause of damage in a large storm is flooding, not the wind. And, let’s be clear here, as there are two types: Surge/Saltwater and Fresh Water. The eye of Flo went directly over Wrightsville Beach and then traveled along the coast of Brunswick County. If by chance you are not aware, the northern bands of rain produce the most rain and are often accompanied by the most wind. So, if you often saw live storm coverage from New Bern, which is about 100 miles north of Wilmington, this would be expected as this is where the strongest rain bands landed. And if by chance you didn’t see the coverage there, it was mostly shots of flooding. Creeks, rivers and streams overran their banks. The good news for most people directly on the beaches is that the storm surge was less than was predicted. No surge is good though as all surges erode our precious and expensive beach fronts, along with protective dunes and foliage. The most flood damage in our area was from the overflowing of fresh water ponds, lakes, streams, creeks and rivers – so homes in low-lying areas or closely situated near these bodies of water prone to flooding are who took the brunt of the storm’s impacts. While Florence was a Cat. 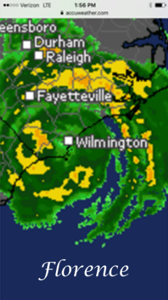 1 at landfall, The Wilmington airport clocked a gust at 105 mph, as did other beaches in the area. These winds, if sustained, will cause minor home/building damage and uproot trees – and that is what we experienced here along the coast. In many of our travels around Brunswick and New Hanover county since landfall, the largest amount of tree damage appeared to be in the city of Wilmington – just on the north side of downtown. Mother Nature spared the strong and took the weakest, of which many were quite large. Let’s just say that if you need some wood mulch that prices will be next to nothing for the next 30-45 days! Two days after the storm, we received a call from a local church saying that they needed supplies to help the firefighters that arrived from out of town and were stay in their gymnasium. This group of 30+ firemen are deployed to areas hit by mother nature and are there to help the local firemen, provide counseling and responding to calls. Shortly after making it known that Grace United Methodist’s kitchen was open, requests for meals for people without power started pouring in. Within 24 hours, the church was feeding 400 local residents. Stories like this were a commonplace across the region. If history has told American one thing, it is that nothing pulls a group of people together like a crisis. Southeastern North Carolina and parts of South Carolina will be back to normal in no time. In fact, many areas here had their trees cleared and power back on within 48 hours of the storm. And, for those that experienced more severe damage, our thoughts and prayers go out to them. Storms happen, just like tornadoes, snow storms, wild fires, ice storms, mudslides, sink holes, volcanoes and other natural occurrences that can affect our day to day lives. We all get through them, don’t we?